The HabitatJAM, which was a prelude to the World Urban Forum (which will be held in Vancouver in June 2006), rocked! Lots of great discussion, word class experts and the bringing together of people of the world into a fantastic set of discussion forums. Kudos to the organizers for getting the crucial part of this event right; rallying the community and getting them to participate! 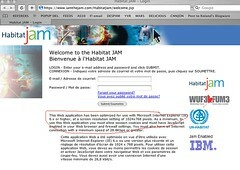 The technology used by the HabitatJAM, however, could have been much improved. No RSS (so you couldn't subscribe to forums as they change), content is only visible if you are registered, really long complicated URLs, old school scrolling banners, warnings about only working with IE 6 (even though it seems to work fine in Firefox, etc. Basically, it would have been better if the HabitatJAM tech team had used what I like to call "Web 2.0" for want of a better term even though that term means nothing! Strange to me that Web 2.0 technology wasn't used since IBM is well aware of Web 2.0 technology like RSS and blogging (and I learned about the HabitatJAM from Tapping into the Wisdom of Communities on the blog of IBMer Irving Wladawsky-Berger). BOTTOM LINE: the fantastic discussions are invisible to search engines which is not good in my opinion. More importantly, the discussion is and will not be not part of the blogosphere and the public web. But it's not to late to fix it. One simple suggestion: have some discussion leaders (or get volunteers who know the tools AND the discussion areas) to blog, podcast, and videoblog synthesis and analysis about the best of the discussion forums. Again, as I have said before in connection with helping the Vancouver established media, I'd love to help out for a free coffee and a free lunch :-) (I assume the technology providers (IBM Global Services?) for the HabitatJAM are based in Vancouver since the World Urban Forum will be here) and I can refer you to people who can help you implement a more modern web strategy.